Time for another Tweet Tasting, through Steve Rush (@TheWhiskyWire) #BallantinesTT tweet tastings. Sometimes it’s great to be me, and today was one of those days! The guys at Ballantines (@Ballantines) had gone all out and produced a fantastic Tweet Tasting set, it arrived in a sleek black box, lined with straw (synthetic, but still great), a glossy, high colour tasting mat, and an interesting flavour profile wheel. There was also a nicely written notice regarding Ballantine’s 12 year old, which was after all, the reason for this tasting. This was Tweet Tastings ramped up with both style and substance, oh and did I mention that Ballantine’s Master Blender Sandy Hyslop joined us, to take questions and provide insights on the night. So what were we tasting? 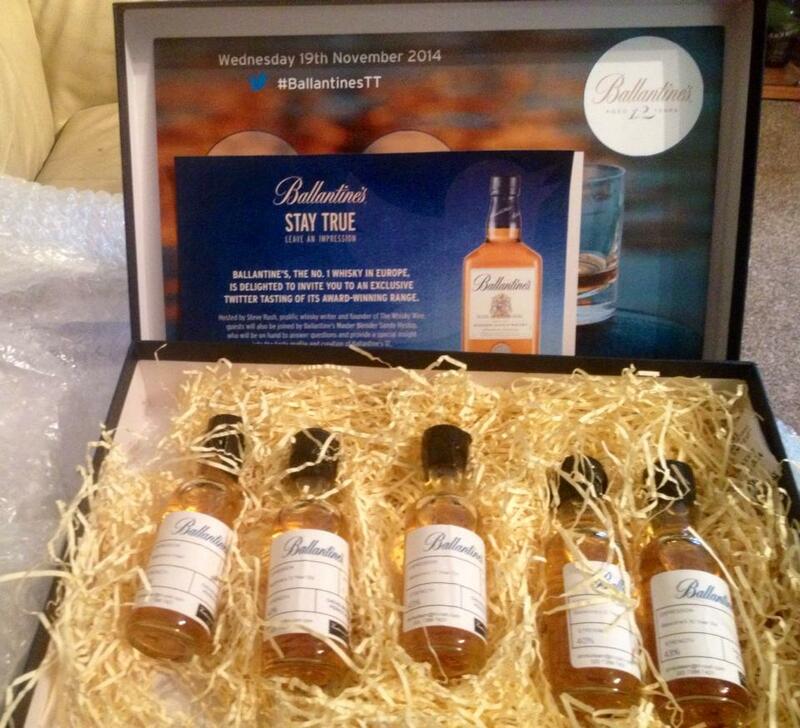 Ballantine’s Finest, Ballantine’s new 12yo, Ballantine’s 17yo, Ballantine’s 21yo and the Ballantine’s 30yo. This starts Barley sweet, with hints of fresh apples and acidic limes. There are subtle pear notes and an almost, short crust pastry, that buttery, floury note, followed up with the rich royal icing. As this opens up in the glass there are notes of a kitchen in the country baking shortbread with sugar. There are definite fudge notes which combine with vanilla, which makes for a comforting nose. The sweetness starts to take on a nutty complexity, like warm Dime (Daim) bar, with honey notes starting to take over. There’s a floral edge, nothing specific, and maybe more the smell of the cellophane from a shop bought bouquet, before cloves and peppercorns add a hint of spice into the mix. The peppercorns combine with baking spices, mainly nutmeg and cinnamon, but the sweetness never fades, creamy with good quality vanilla ice cream notes to end, with just a little touch of smoke, but it’s faint. Fudge sweetness from the nose is there as expected with lashings of vanilla ice cream, topped with smooth milk chocolate sauce and chopped hazelnuts. Then there are soft red apples in abundance, they are mouth-wateringly soft, in comes warm honey with an oats and milky porridge note that adds to the sweetness. There is gentle pear in the background before candyfloss notes and toffee apples take over finishing with incense smoke from Camden Market. The apples linger on, but once opened up, there is a little heat, cloves rather than peppercorns, a touch of ash so easy drinking, the sweetness is constant, and whilst the soft red apples and fudge are so present you want to bite them, it can be a little thin in places, but there is so much flavour packed into this you don’t have time to dwell on this. Rich, smooth and creamy blend comparing to the finest which is more floral and delicate. Ballantine’s 12 is characterised by more honey, toffee and creamy notes compared to Ballantine’s 17yo. Master Blender, Sandy Hyslop has picked this as his favourite from the entire range. First off for me is coconut ice, which is at once both drying and sweet. Then you are transport to an orchard in summer with warm apples, soft pears and honeysuckle sweetness in the air. There is sweet dusty icing sugar before the rich damp oak appears. That icing sugar dust, turns grittier, more reminiscent of teacher’s chalk before the smoother vanilla, honey and butter notes make an appearance. If you ever, (as a kid) buttered a digestive biscuit and put golden syrup on it then that is exactly what I’m getting, that lovely malty, cereal sweetness with chocolate Horlicks notes. There is a gentle note of citrus still but this is more lemon drizzle cake rather than harsh lemon peel. The rich creamy mouth feel, brings hot yet drying oats. There is so much cask influence on this one, with hint of damp, dark rich oak. There are touches of milk chocolate before red fruits burst forth with strawberries, raspberries and some cranberries all dripped with honey. Barley sweets and oranges with ginger, this dram just keeps giving, blackcurrants wander in, with a hit of lychee sweetness and homemade scones with clotted cream and hot batter sweetness. Warm leather with a little beeswax and milk chocolate hidden away at the back. It’s creamy and smooth with a touch of coffee and cream before a stronger, earthier fennel and moss note come through. Things start to sweeten up as baked Demerara sugar linger with Lilly pollen before the fruits make themselves known. Orange zest is acidic on the nose, before soft stewed fruits in the form of plums, damsons and blackberries burst through. There is a slight trace of Madeira cake and vanilla cream with puffs of pipe smoke and just a little new make coming through with crisp apples and a hint of fresh lime. Right to the end this is still very fruity, with a touch of linseed oil and parcel tape. Hot, ginger and chili slap you in the face! Then parsnips roasted in honey with some baby carrots too, it’s vegetal and sweet, followed by a huge mouth of damp grass. There is a gentle sweetness of milk chocolate buttons Next up are the herbs, thyme, sage & basil carry the freshness on, and as it starts to warm in the glass there are warmer notes of hay, raisins and stewed rhubarb with orange and lemon, gentle lemon though whereas the orange is not shy in coming in and making itself known, like an extrovert at a party. Wax seals and parchment paper are on the finish, a waxy yet oily coating that lasts and lasts. Ballantine’s 21YO is creamy and it’s got a nutty influence coming from the oak cask that differentiates it from the Ballantine’s 17YO. Sweeter on the palate with a more intense spiciness than the Ballantine’s 30. Hello rum! bananas en flambe, sugar cane, rich dark raisins and oranges studded with cloves. There are so many spices with nutmeg, paprika, and bay leaves. There are hot molasses, sticky marmalade and a meaty note with well salted sticky, honey gammon. As the whisky continues to open up you get rum truffles, dipped into Seville marmalade, brushed with gentle suede and then smashed into an oak tree, wow! There’s that rum note from the nose and then the honey is super sweet, almost too much, but then saffron, paprika & white pepper, temper this nicely, there’s also a heavy note of aniseed. There’s some dark chocolate orange, with a hint of Turkish delight before the oak makes its presence known with a fantastically rich and mouth coating tannins which are nicely drying. As the flavours start to tail off you find overcooked flapjacks, with the burnt bits scraped off, but you know they are there from the bitter oats. Bursting with juicy pear flavours and concentrated fruits like peach. Ballantine’s 30yo is deeper, more complex and less spicy than the Ballantine’s 21. The very first batch of the Ballantine’s 30 was sold in 1930, so the stock was laid down in 1900. There are juicy berries aplenty and hot Ribena. There are soft pears and beeswax. The oak is so drying, this is soon lifted by rich milk chocolate and banana’s spread on buttered white toast with split vanilla pods. The cantaloupe melon and the floral notes from the nose prevail and I love the lingering hint of jasmine, the melon sweetness, and a touch of parmaviolets right at the back with the vanilla creaminess running throughout the whole experience. What a night. The whiskies really were outstanding! Anyone who thinks blends can’t be as good as a single malt would do well to try some of these whiskies. The complexities that Ballantine’s manage to keep running throughout the entire range is exquisite. The 30yo was just stunning, I don’t think I have ever picked up so much on a nose before. The whole night was a wonderful experience and I can honestly say I enjoyed all of the whiskies very much. Ballantine’s really made me rethink blends that day. If you have a chance to try the Ballantine’s range then please do, you won’t be disappointed. Very very descriptive! How did you get to the point where you can detect so many aromas,tastes, in a whisky? Blends as you say can be quite decent. What are your thoughts on Black Bottle? Its all just a learning curve and things you pick up as you go on. We’ve not had the black bottle for a while, and of course there’s the new blend to try now too.